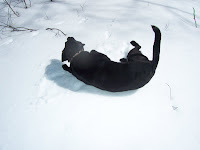 The resident lab does this snow bath thing a lot lately. I'd like to think he is making a deliberate effort to get rid of whatever is making him so odiferous and clean up his act. I think it just feels good though. Which leads me to a quick spring ski report - incredibly excellent conditions prevail. It has been getting cold at night and nice and warm in the daytime. The temperature was 60 degrees yesterday on the deck at the homestead. This is perfect maple-sap-running weather and corn snow production weather! Whiteface is in 'excellent' condition. The pond skimming contest is next weekend and it is always interesting. Mount Van Hoevenberg skiers have enjoyed an awesome year, and even though the venue is formally closed for the year, the trails are completely covered in corn snow by 9 or 10 a.m. Last evening's ski was outstanding. We had one of the biggest snow years in a long time, since 2003, so there is a great deal of snow still freezing and thawing, especially in the backcountry. Ski trails in the higher backcountry are fun, great skiing.